Does it ever feel like a stream of clutter is slowly turning your mental space into a chaotic mess? If the answer is yes, it means that your mind is in desperate need of some headspace. We tend to think of clutter as being all the physical stuff lying around in our homes. 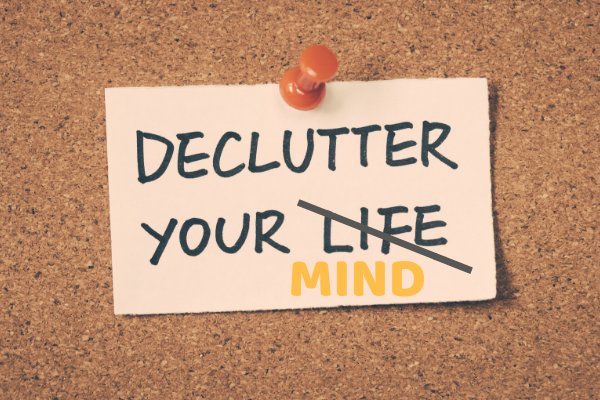 None of us want a cluttered up living space and we are often quick to notice when our homes become cluttered and messy; but clutter can be thoughts of anything that limit or distract you and anything that disrupt the flow of positive energy. It is common for us to have a lot of clutter in our minds and to hold on to patterns of thought that are stagnant and negative. We have around 60,000 thoughts every single day, so it is ever likely that we feel overwhelmed and cluttered in our minds. When our minds are clear, we allow energy to flow. Rather than feeling clouded, muddled and confused we can allow ourselves to feel at peace and enjoy clarity. Outlined below is my five-step exercise for de-cluttering the mind. Enjoy! Choose a time when you will not be disturbed. Switch off the phone. Get yourself in a comfortable position. Take a few deep breaths and begin to feel any sensations within the body. If you feel your mind wandering off just concentrate on your breathing and bring your thoughts back to sensations within your body. Continue breathing….in through the nose out through the mouth. Now, allow yourself to become aware of the thoughts that are popping into your head. Be mindful and take notice of every thought that flows into your mind. Just give yourself permission to feel and experience everything that comes into your mind. What were you thinking of? Consider what thoughts kept cropping up. Were there any reoccurring thoughts you had? Try to identify the thoughts you had by recording it in your notebook. Were you surprised by your thoughts and thought patterns? How did your thoughts make you feel? You may notice that some of your thought fall into main categories, for example, you may have thoughts that belong in a ‘fear’ category or an ‘excited’ category or even a ‘to do’ category. By categorising our thoughts, we gain insight as to what we’re commonly thinking of rather than feeling overwhelmed by the multiple random thoughts in our mind. Now you know what clusters of things you are thinking about, write them down in your notebook and decide what clear actionable steps that need to be taken. Now that you have an action plan you can release the nagging clutter from your mind and start dealing with the issues bothering you in a clear and concise manner. Remember the important thing is that you don’t give your thoughts the power to rule you, that instead you have a peaceful control over the thoughts that enter your head. If you are interested in learning more about Emotional Detox and its benefits, please visit our website here.